Estex 2420 Canvas Combination Glove/Sleeve Bag has quick release snap for belt attachment, snap closure. ESTEX 2426-3XL Combination Glove/Sleeve Bag has canvas quick release snap for belt attachment, snap closure. 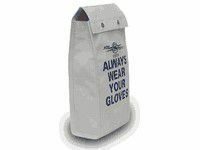 Estex 2426-AE Combination Glove/Sleeve Bag is a two pocket bag for high and low voltage gloves and sleeves. Estex 2427-XC Combination Glove/Sleeve Bag is a two pocket bag for high and low voltage gloves and sleeves. Estex 2429 Canvas Combination Glove/Sleeve Bag has quick release snap for belt attachment, snap closure.